A small stone thrown into a giant lake creates a ripple. Similarly, our actions also create ripples in the lives of others. There are consequences to our actions – whether good or bad – for both people we know and people they know. So says Steve Harper, author of the wonderful book The Ripple Effect: Maximizing the Power of Relationships for Your Life and Business. 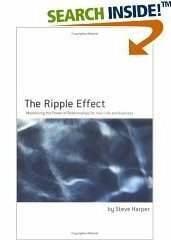 In his book, he shares a plan to harness the power of the ripple effect to positively impact the lives of others, and in so doing, to improve your own life. He knows first-hand about the benefits of the ripple effect. He built his career on these principles. As a serial entrepreneur, he used them to build several companies from the ground-up. Now, he is a professional speaker and strategic consultant who helps his clients use these very techniques. He says the return on selflessness is astonishing. That’s why this is a great book for entrepreneurs, executives, and sales people. However, it’s a fantastic resource for any and all of us who have any human contact. That includes most of us! Learn about the benefits of building relationships and why understanding yourself better helps you understand others better. How to leverage your relationships and make the most of your opportunities. Learn how to take relationships to the next level as well as techniques to build relationships. So check out The Ripple Effect Don’t take our word for it – test drive it yourself! *W are amazon affiliates. If you buy Steve’s book though the link we’ve provided, we will get a small portion of the sale.